50 Kms west of Jaisalmer, Rajasthan, India, 2 March 2009. 880. Pyrrhulauda melanauchen. The Black-crowned Finch-Lark. Coraphites melanauchen, Cabanis, Mus. Hein. i, p. 124 (1850). Pyrrhulauda affinis, Blyth, Ibis, 1867, p. 185; Hume, S. F. i, p. 212. Pyrrhulauda melanauchen ( Cab. ), Hume, S. F. vii, p. 64; id. Cat. no. 750 bis; Barnes, Birds Bom. p. 277; Sharpe, Cat. B. M. xiii, p. 655; Oates in Hume’s N. & E. 2nd ed. ii, p. 248. Coloration. Male. Resembles male of P. grisea, but differs in having the forehead broadly white, the whole crown dark chocolate-brown or blackish, and the white of the ear-coverts produced narrowly round the hind neck to form a collar; the black sides of the neck are also produced as a collar over the mantle, immediately behind the white collar. Female. 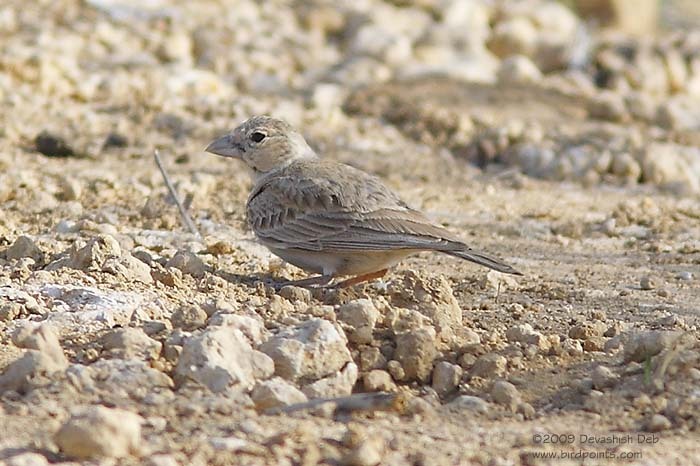 Resembles the female of P. grisea, but is much paler and more sandy; the lower plumage is less rufous and almost pure white on the abdomen, and the streaks are fewer in number. Bill pale whity brown, bluish on lower mandible; legs and feet pale whity brown; iris brown (Hume). Length about 5.5; tail 2.2; wing 3.3; tarsus .65; bill from gape 0.5. Oates, Eugene W. 1889-90. The Fauna of British India, Including Ceylon and Burma. Birds.- Vol. I-II. 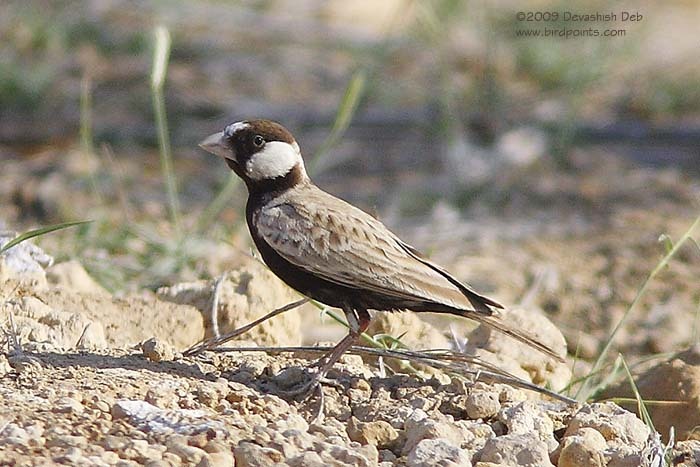 Mr. Scrope Doig found the nest of this species in Sind. He says: "This bird, wherever there are sand-drifts, is very common and is never, as far as my experience goes, found in company with P. grisea." Hume, A.O. 1889-90. The Nests and Eggs of Indian Birds. 2nd Edition. Vol. I, II & III. Copyright © 2006-2009 birdpoints. All rights reserved.